Former national chairman of the All Progressives Grand Alliance (APGA) and Senator representing Anambra Central senatorial district, Chief Victor Umeh has fired back at the Imo state governor, Rochas Okorocha, for describing him as a non-performing lawmaker. Briefing the Senate press corps on Wednesday, the lawmaker expressed regrets for supporting Rochas Okorocha when he was the chairman of APGA ten years ago. According to him, the Imo governor’s attempt to impeach his current deputy, Chief Eze Madumere, who might be the second to be impeached was an indication that Okorocha is a bad leader. Umeh revealed that Okorocha began attacking him because he advised him not to instigate the impeachment of Madumere having allegedly seen to the impeachment of his first deputy, Chief Jude Agbaso during his first tenure. “Rochas Okorocha is about making history in Nigeria as the only Governor that impeached two deputies and because I advised him against impeaching the current one, he started attacking me. 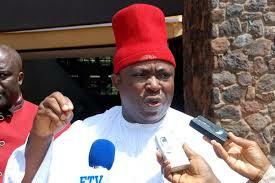 “I regret supporting him to become a governor of Imo state against all odds. “I didn’t know he is a trickster and a ‘419” who found his way into office through fraud and deception,” he said. Recalling how the Imo governor declined honouring agreements with other party stalwarts from the state who ensured his success, Umeh held that Okorocha turned himself into a tiger and attacked all of them. He said that he personally signed agreement that brought Okorocha to power, but later saw that the governor was a trickster, adding that he then had to leave him. The lawmaker accused Okorocha of attacking religious leaders and elder statesmen, threatening that he will publish the governor’s “fraudulent” transactions if he continued vituperation against him. “Here is a man who was answering ‘yes sir’, ‘yes sir’ to me, even in the presence of my Police orderly who has been working with me in the last thirteen years. “On getting to office, he suddenly changed, became a tiger and was attacking every body. I have documents of some of his fraudulent practices and if he continues to attack on me, I will publish them,” Umeh warned.